David Joseph, the Brits chairman, said the ceremony would "rewrite that wrong". Adele was memorably interrupted by host James Corden as she collected her second trophy of the night, for best album for 21, over fears the event would would overrun its live time slot on ITV. James, again hosting the bash, has admitted he has no idea whether there are contingency plans in place if timings go awry again. In an interview Mr Joseph expressed his concerns over the incident, which saw Adele making a one finger gesture on camera after being wound up. He told The Guardian: "How can you take an artist who has made the biggest cultural impact musically this country has seen globally for some time and cut her off in the middle of her speech? I very much to this day question what was happening in that control booth. I can hint something is going to happen this year to rewrite that wrong." Mr Joseph, the chief executive of music giant Universal's UK operation, added: "I'd stay tuned to this year's show to see if there is any form of squaring of that circle." 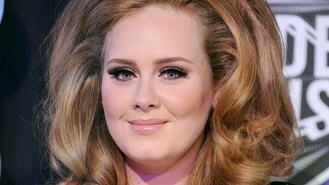 Organisers have introduced a new award this year recognising global success, which is expected to go to Adele, although she faces competition from One Direction and Mumford And Sons. The 2011 release date of her album means she was ineligible for a number of categories, although her Bond theme Skyfall is in the running for best single. The event at the O2 Arena in Greenwich, south-east London, on February 20 is shown live on ITV and could see Amy Winehouse pick up a posthumous Brit Award after she was shortlisted for best British female against acts including Emeli Sande. Sande, Mumford & Sons and Mercury Prize-winners Alt-J lead the nominations, competing for three awards each.